Cycle use is rising in London following the introduction of the congestion charge, not because of the London Cycle Network. 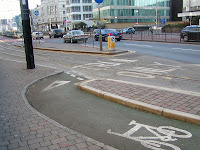 This blog is a commentary on the 45 miles of substandard cycle facilities in Croydon. This is one of the worst pieces of design in Croydon. 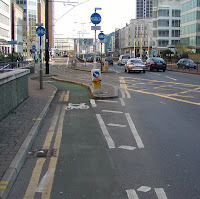 The reason it doesn't kill cyclists on a regular basis (as Wellesley road regularly kills pedestrians who try to cross it) is that very few cyclists venture onto this urban dual carriageway, and those that do ignore this utterly stupid cycle facility. This is apparently called a jug handle! 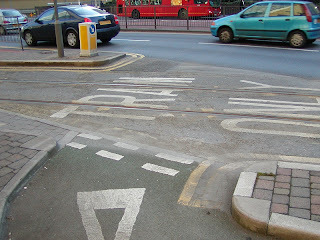 It is at an infamous cycling black spot where several cyclists have come off on the tram tracks. The cycle facility is quite ridiculous on a fast moving dual carriageway where all the traffic is breaking the speed limit, and I have never seen it used. However, we know of one cyclist who was hit by a bus when she tried to use it! The new version is even worse, it now directs cyclists out into two lanes of speeding traffic. 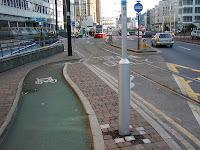 It is so utterly stupid that most cyclists end up riding up the tram tracks. Personally I take the vehicular route and ride through as if I was driving a car. All that has changed in 5 years is the addition of some green paint. The Wellesley Road/George Street "Y"
Who Builds This Crap ?